Happy New Year!! I've taken a bit of a winter hiatus from posting for a few reasons, including puppy-mom'ing and my dark dark kitchen. I decided instead of posting nothing, I would focus a bit more on some final photos of the baking projects and not worry as much about the process shots. 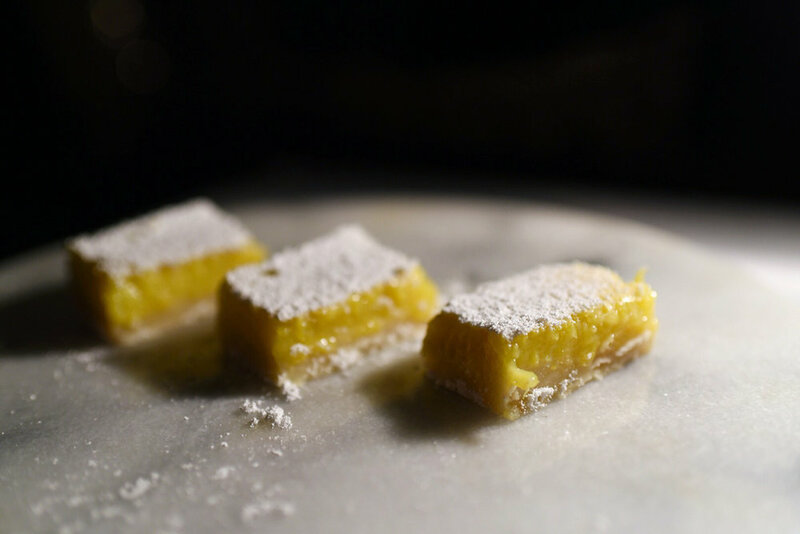 I have had a few baking attempts in the last couple months where it was just too dark to get the shots I wanted while testing recipes and so here I have a super tasty lemon bar recipe that I created using inspiration from a couple different recipes. I've been very focused on baking Gluten Free items lately because I've personally been avoiding gluten (except for the cinnamon rolls I made Sunday morning..because why bother eating them if they aren't full of gluten.) This was my first time really making lemon bars and I find them very indulgent and amazing. A little goes a long way! My curd isn't a traditionally eggy curd, but it is the perfect balance of sweet and tart and showcases a gorgeous bright yellow color thanks for the lemon zest that doesn't get strained out. I hope you enjoy! I photographed these beauties in a pitch black room with only an overhead lamp... It's a slightly different feel than my normal style but the more I look at them the more I really like them. What do you think? Grease a standard bread loaf pan and cut a piece of parchment to fit with the long sides overhung. 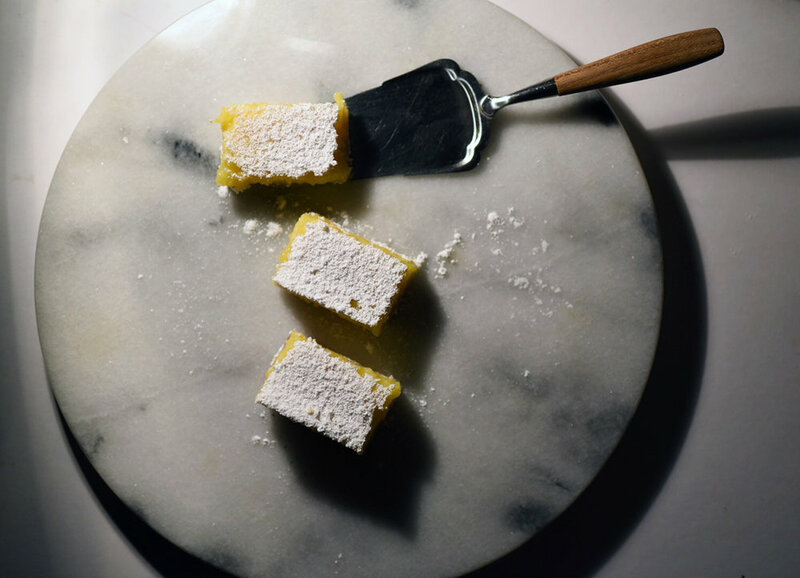 This will allow you to completely pull the lemon bars out of the pan with ease for cutting and eating. Mix together all dry ingredients for shortbread crust, cut in butter and vanilla until coarse and crumbly. I use a fork and my fingers here but feel free to pulse in a food processor if that's more your style. Press shortbread crumb into bottom of prepared loaf pan. Press down evenly and firmly until you have a nice flat stable crust. Bake in preheated oven for 8-12 minutes, crust should be very lightly golden brown on edges but very soft and almost bubbly looking. Do not over bake. While crust is cooling, mix together flour, sugar and lemon zest. Add eggs and lemon juice and whisk until everything is mixed together and smooth. Pour lemon goodness over cooled crust and bake for about 20 minutes. Check at 18, then every minute after that. Center should wiggle slightly when pan is moved.